In dystopian storytelling, the protagonist often serves as little more than an avatar for the audience in order to explore some exaggerated negative feature of civilization. In order to be an effective audience surrogate, whether it is Winston Smith or Bernard Marx or Josef K., the dystopian protagonist only needs to accomplish two things: break a law and be an internally consistent character. Writer-director Neill Blomkamp’s Elysium, the follow-up to his 2009 Oscar-nominated sci-fi apartheid District 9, drops the ball on the latter requirement and mistakes contradiction for character development—leaving the film unmoored in a sea of shaky-cam fight scenes and strobe light lens flare. Exchanging the aforementioned apartheid politics of his native South Africa for an exploration of US border policy, Occupy Wall Street, and universal health care, Blomkamp’s latest offering depicts a disease-ridden and overpopulated 22nd century earth left in ruins (think Wall-E meets Idiocracy). Meanwhile the one-percenters offshore their wealth and families in the titular space station Elysium—a floating Cayman Island-turned-Club Med with enough firepower to keep the undesirables at bay. Protagonist and chief undesirable Max (Matt Damon) scrapes together a living assembling police droids in the ruins of Los Angeles when, ironically, a police droid takes it upon himself to disassemble Max’s arm with a billy club. 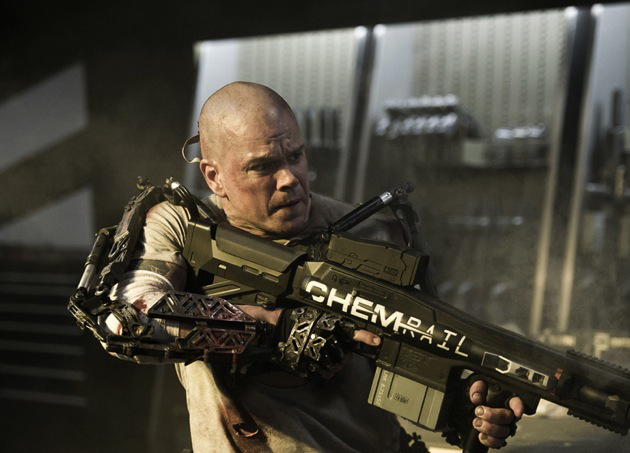 This first instance of ultraviolence which periodically intrudes on Elysium conveniently leads Max to reconnect with his childhood friend and nurse Frey (Alice Braga). In an attempt to provide backstory where none is necessary, the film shoehorns flashbacks of Frey and Max discussing their dreams of reaching Elysium while Max’s caretaker predicts, apropos of nothing, that he will affect great change in society. Considering Max grew up in a Spanglish slum yet somehow managed to develop a perfect Boston accent, perhaps his caretaker was right to deem him special. Blomkamp uses these flashbacks as a crutch to make the audience care about Max and Frey while underdeveloping the dramatic potential of their relationship in the present. Their larval relationship is short-lived as Max, in a Dickensian twist, is forced to fix a hazardous machine and gets a lethal dose of radiation that is set to kill him in exactly five days. With an artificial deadline compelling him into action, Max’s all-consuming desire for self-preservation leads him to find a way to Elysium where they have the medical equipment necessary to cure him. This desire for self-preservation makes Max one of the least heroic protagonists of a big budget sci-fi movie since Clive Owen’s character in Children of Men. When his ex-partner in crime Julio (Diego Luna) offers him a trip to Elysium in exchange for hijacking the data stored in his former boss John Carlyle’s brain (William Fichtner), Max finds himself knee-deep in Elysian political intrigue that could lead to tyranny or solve the world’s inequality problem. However, the threat of Elysian tyranny would be more effective if the villain, Secretary Delacourt (Jodie Foster), were given an opportunity to provide character motivation for her reprehensible actions beyond platitudes such as “we’re preserving our way of life.” For a film that pushes its politics to the fore, the hollow treatment of the Elysians offers no chance for discussion and, instead, treats its unmotivated characters as cogs that turn in place until the next action set piece. The shining exception is the rogue agent Kruger (played by District 9 star Sharlto Copley), who is contracted by Delacourt to hunt down Max, and in the process, manages to find the sweet spot between pitch-black humor and malice which the film as a whole can never seem to find. As Max discovers the content of the stolen brain data MacGuffin, he transforms into a Deus Ex Matt Damon capable of resetting all the world’s problems with a single computer hack, Elysium gives up on its political allegory ambitions and unceremoniously switches genres—from sci-fi to pure fantasy.